DataNumen SQL Recovery is a powerful tool to repair and recover corrupt SQL Server MDF database files. It can scan the MDF files and associated NDF files, then recover your data in them as much as possible, so to minimize the loss in file corruption. Main Features: Support SQL Server 2005, 2008, 2008 R2, 2012, 2014, 2016, 2017, 2019. Support to recover the structure and data in the tables. Support to recover all data types, except for XML type. Support to recover sparse column. Support to recover deleted records. Support to recover indexes. Support to recover views, triggers, rules and defaults. Support to recover stored procedures, scalar functions, inline table-valued functions and multistatement table-valued functions. Support to recover and decrypt encrypted objects. Support to recover multiple files, including MDF file and its associated NDF files. Support to output recovered data in MDF file or plain text file containing SQL statements that can reconstruct the database. Support to recover MDF/NDF data from undamaged or damaged VMWare VMDK(Virtual Machine Disk) files(*.vmdk), Virtual PC VHD(Virtual Hard Disk) files(*.vhd), Acronis True Image files(*.tib), Norton Ghost files(*.gho, *.v2i), Windows NTBackup files(*.bkf), ISO image files(*.iso) and Nero image files(*.nrg). Support to recover MDF and NDF files as large as 16TB. Support to repair MDF files on corrupted medias, such as floppy disks, Zip disks, CDROMs, etc. Support to repair a batch of MDF files. Integrated with Windows shell, so you can repair a MDF file with context menu in the Explorer easily. Support drag and drop operation. Support command line parameters. Changes: - Redesign the batch recovery engine. - Support to save batch recovery log. - Fix some minor bugs. 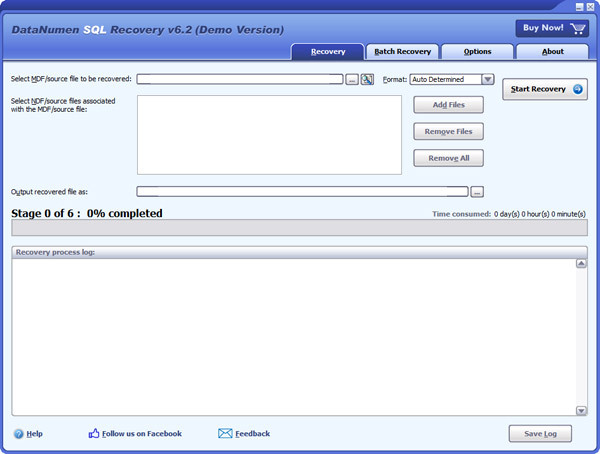 Press release: DataNumen SQL Recovery 4.1 has been released! DataNumen Inc., a world leader in data recovery technologies, announces DataNumen SQL Recovery 4.1. This application lets anyone repair corrupt SQL Server MDF databases with remarkable ease. This product can be freely distributed through the Internet. To put it onto a CDROM, contact sales@datanumen.com. DataNumen SQL Recovery Copyright(C) 2001 - 2019 DataNumen, Inc., All rights reserved. All rights reserved. DataNumen SQL Recovery END-USER LICENSE AGREEMENT This DataNumen SQL Recovery End-User License Agreement (the "Agreement") is a legal agreement between you (either an individual or a single entity) and DataNumen, Inc.